Tomorrow, all across Hopi, prayer feathers) to bless all of life will be delivered to homes, villages and shrines all across the region far outside the boundaries of their reservation. The Soyal Ceremony prayers and rituals help the Hopi turn the sun toward its summer home and begin giving strength to all life for the growing season ahead. It accepts and confirms the pattern of life development for the coming year. It includes reverent silence, fasting and humility and eating of sacred foods to achieve spiritual focus. 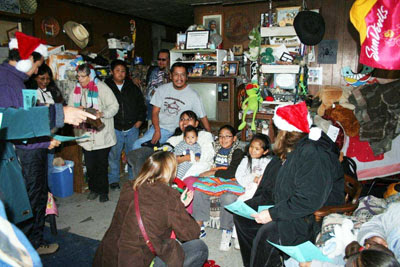 Much of this activity occurs within the kivas and Soyal ceremonies are not open to the public. What seeds are you planting for your new year? We are in the midst of this 14th annual gathering of donations to supply food, new clothing, learning books, sports items for kids and toiletries for elders. We appreciate the participation of people from across the US and Canada. A new coat is a big deal for Hopi pre-schoolers. We have 170 kids left to support–if you can get them the coat (and other clothes if you can), we will add activity books and a note from you and deliver it when they get back to Head Start after the break. We will be doing this all year. We give you the child’s first name and clothing size and you shop/ship to us or we order for you and include your note. Thanks to those of you who already have done this. We appreciate the energy and heart you put into that. We also welcome sponsors to send some preschool activity books for a whole classroom. There are 10 classrooms with 19-20 kids each or 195 total students. I will provide you the direct address to Head Start and the name of a teacher who will give them out to the kids to use at home. If you need a tax receipt, we provide that if you send us your receipt of purchase and noticfication of when you shipped. Great news: we received a $20,000 grant from a private foundation to buy needed playground equipment for the 4 playgrounds! 12 pieces of equipment are on the way to Hopi Head Start. And we are working with Director, Rayma Duyongwa, to develop a 3 year plan that will include natural playground elements and much more. We will be seeking donations to purchase the natural playground elements such as pavers, garden soil, fruit trees and logs. You are welcome to come help for 4 weekends in March 2014 when installation work for equipment and some of the natural playground elements such as garden plots, hop scotches made with pavers, man in the maze labyrinth, obstacle course and fruit trees will be underway. More details coming in January.